When it comes to weight loss supplements, fiber gummies are the most effective way to increase your fiber levels. They bind to water and turn into a gelatinous substance that lubricates your digestive tract and helps to eliminate toxins. In addition, they can be an amazing ally that helps you keep your appetite under control. Therefore, if you're trying to lose weight but having a hard time limiting your calorie intake, fiber gummies can be your go-to supplement. All-natural fiber gummies, like Skinny Piggies, are safe for use and they don't come with any side effects. In addition, they can be a delicious yet calorie-free treat. Why is Fiber Gummies The Most Trending Thing in Dieting? We all love to eat snacks, but they unfortunately add inches to our waistline. Now, you can help your diet by chewing on special hunger suppressant gummies called Skinny Piggies! 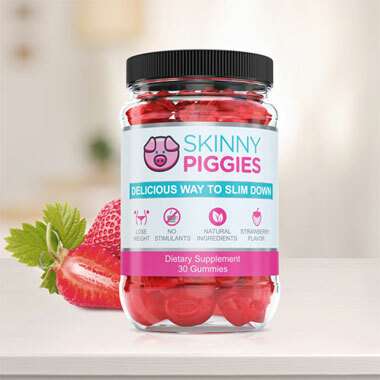 Skinny Piggies are fruit flavored all-natural gummy supplements that help fight food cravings and appetite while supporting your body to remain in fat loss mode. The secret of weight-loss is not difficult to get: Take in less calories than you burn off and you'll lose fat. However when you start lowering calories, cravings will begin, and appetite and hunger become very difficult to control. That's where Skinny Piggies can help you! These yummy appetite suppressant gummies are developed to help you to stick with your weight-loss regime by making you feel less hungry. 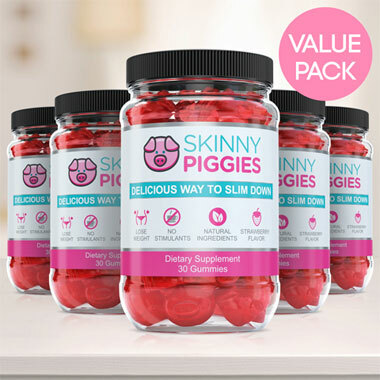 The idea behind Skinny Piggies gummies is pretty simple. Your hunger is regulated by 2 key things: the calories you consume and the feeling of food in the stomach. After a big meal, your stomach stretches from the food pressing against the sides, that makes you feeling satisfied and no longer hungry. Have one Skinny Piggy 30 minutes preceding your lunch with a glass of water. Once the gummy supplement gets to your stomach it will absorb the water and expands into a mushy gel. This gel then occupies space and tells your nervous system that you just ate a good portion of food before you even started to eat. A half hour later and you can begin enjoying your desired meal! At this moment, the gel is being very slowly digested and you feel partly satisfied and that will help you eat a smaller portion and consume fewer calories and still end up feeling full and satisfied. 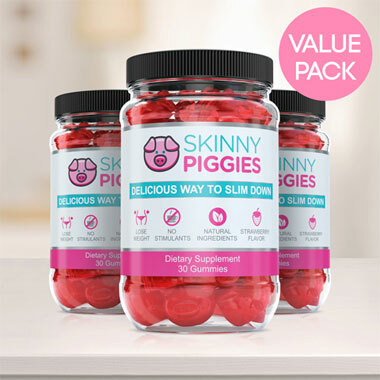 Take one Skinny Piggy gummy and you'll eat fewer calories, reduce carb cravings and allow your body to burn fat all while feeling full. That's how you can reduce appetite and hunger, food cravings, and eat less, all without feeling hungry all the time. The soft gel also enables the stomach to empty slowly and that will make you satisfied for a longer time. The sooner you feel satisfied, the less likely you are to continue eating that allows you to achieve your weight-loss goal quicker. As the viscous gel coats the food, it delays the digestive function of sugars and flattens the blood glucose. By eliminating quick rises in your blood glucose you prevent those unbearable cravings. When you avoid blood sugar spikes by slowing down the absorption of sugars you are stopping it from being stored as unwanted body fat which then sets off your body to burn off its stored fat. The slower the digestion process the longer your body remains in weight loss mode. Skinny Piggies have absolutely no chemical additives - you can pronounce all of the ingredients. The beneficial, all natural ingredients in Skinny Piggies also have additional benefits such as support for potent anti-aging benefits, strong hair, and glowing skin. Skinny Piggies contain no stimulants and no harsh chemicals. No stimulants means no burning out and you can take them before dinner too. No harsh chemicals means these gummy supplements are gentle on your stomach. Finally, what other diet pill is as tasty as a mouthwatering fruit flavored gummy? 'Thought so. You'll enjoy eating them so remembering to take your health supplement will not be a hindrance. They're tasty and anyone can get started right off the bat. Try one and we're sure they will certainly become a highlight of your day.